With JungleMail you can make it easy for your recipients to unsubscribe from your emails or to subscribe to certain topics. In this tutorial, you will learn how to use the subscription and unsubscribing process in JungleMail. In order for recipients to be able to subscribe to your emails, you need to configure subscription functionality first. Note: you can fully customize the appearance of the JungleMail Subscription Web Part. 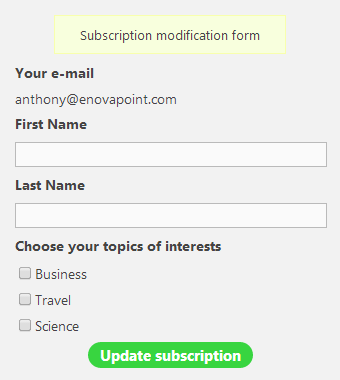 Read about customising subscription form for more instructions. JungleMail lists are available in the main site collection (the one that you use to send emails from). When a user clicks a link, he is taken to the page with the JungleMail Subscription Web Part. When a new user subscribes by selecting topics of interest, a new item in JungleMail Subscribers list will be created, containing his subscription information.